Price is $695. $45 shipping (heavy) with local pickup an option. 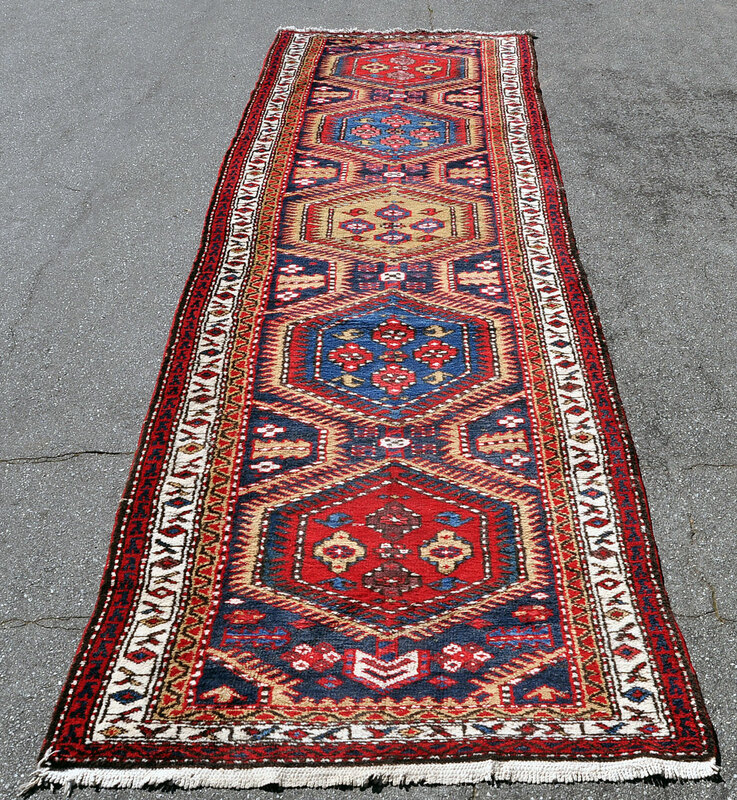 Dazzling large village runner from Hamadan District of Iran. This is a traditional Mazlaghan ‘lightning’ motif — serrated gold lightning enclosing red medallions, black fields, and creating a vibrant geometric design. 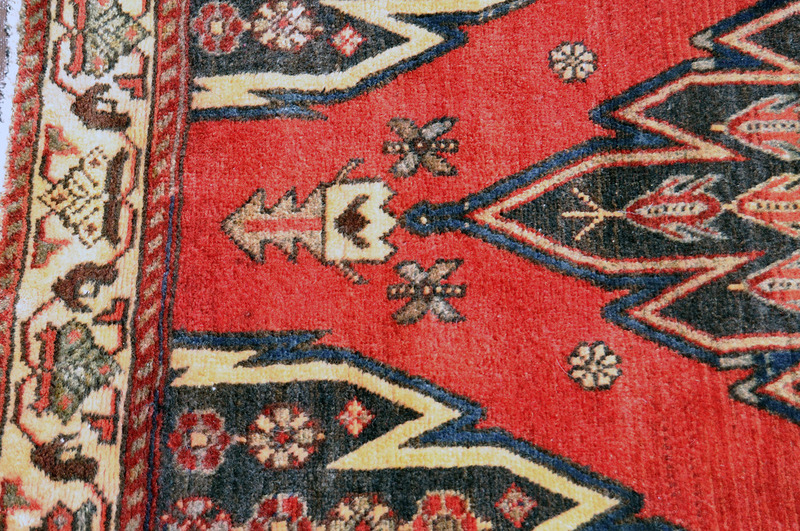 The rug has quite a bit of abrash (variation in color due to different wool dye batches) — which creates muted areas as well as bold zones on the rug. Wool on cotton warp & weft. Excellent overall condition with only minor wear. No holes, stains, or issues. Incredible art for your floor! Ready to use. This rug has a dense weave and can handle foot traffic. 1970s. Very good size at 12 ft. 6 in. 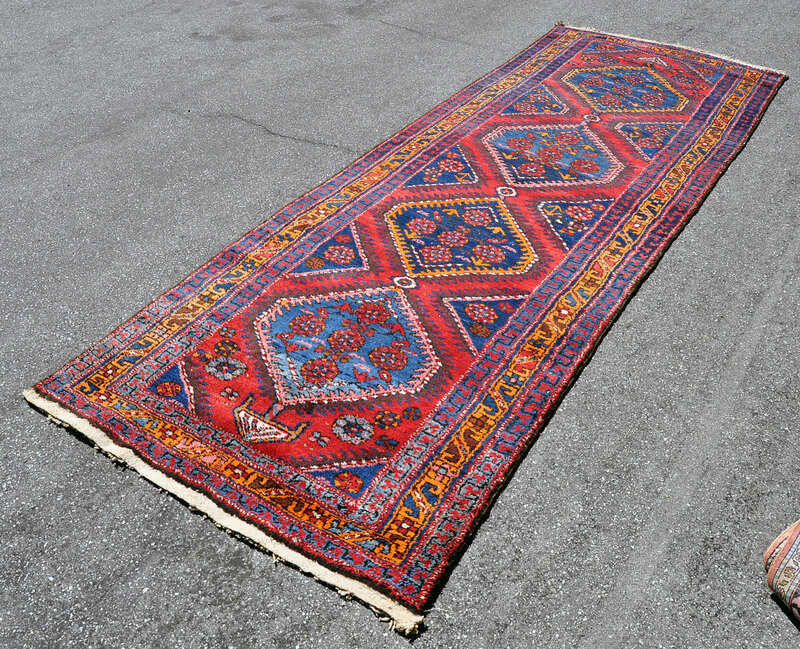 by 4 ft. Mazlaghan rugs are a personal favorite, but they are generally on the small side (3 by 5 feet or 4 by 6). Not easy to find a good-sized runner like this one. Price is $385. Shipping is $43 or free pickup. Please email me with questions or to discuss a purchase. Thank you. Dazzling geometric village runner from the area around Sarab in Northwest Iran. 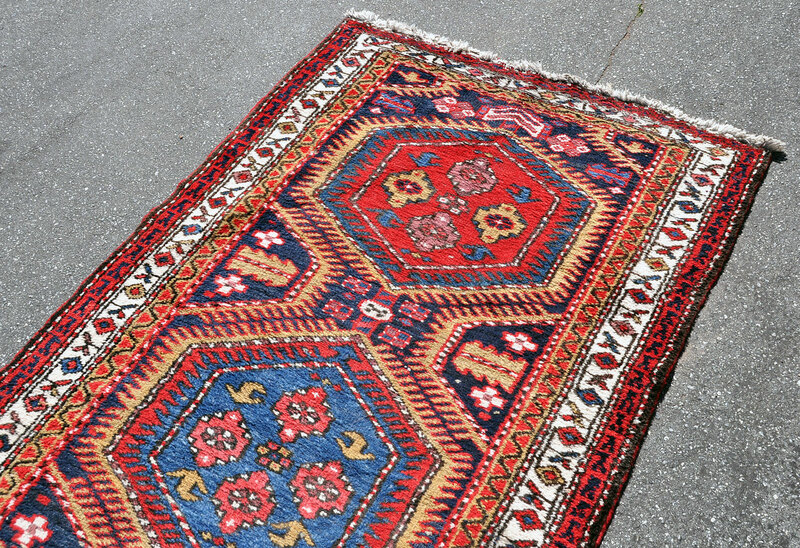 This borders Azerbaijan and the Shirvan carpet region so there are many shared characteristics. Wonderful olive greens and assorted blues, and outstanding quality dyes. Condition is very, very good with minor pile wear. A bit of wear & tear on the cotton fringe of one end. A very solid and well crafted piece of tribal art. Exact size is 11 ft. 4 in. by 3 ft. 5 in. Out of a German estate. 1960s. Natural wool pile on natural cotton warp. Price is $439. Shipping is $43 or free pickup. Please email me with questions or if you want to discuss a purchase. Thank you. Striking geometric tribal runner from the Khamseh area, northern Hamadan region. Gorgeous colors, and the blues and salmon in particular appear to be natural dyes. Very minor wear. The wool pile is fairly thick. The warp is natural cotton. Very good overall condition. The rug has been professionally WASHED and is ready for the floor. 1950s — 1960s. Size is 10 ft. 5 in. by 3 ft. 7 in. 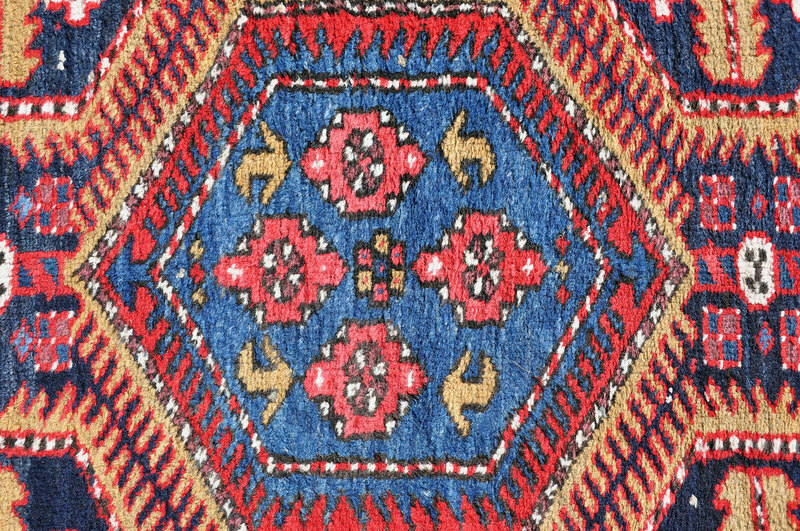 Many rugs in the northern Hamadan area are woven by Kurdish weavers, and this is possibly true for this bold village rug. The price is $489. Shipping is $39.